If you want the shape of our Starboard Underwired bikini but with an exotic twist, then our Costa Rica Underwired Top is going to be the one for you. Offering great support without padding, this luxe jungle print bikini is designed to fit and flatter up to a J cup. 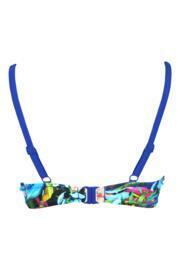 The detailing is lovely too, with a vibrant blue piping, adjustable straps and bow to the centre front. Simple lines and style, looks great. Lovely colours. Perfect fit feel safe as rather large up top. Good fit. Secure fit. perfect math for bikini bottoms.